Cutting covcs on the tablcsaw with an angled fcncc is handy (see AW #64, pg. 47), but clamping the fcncc to the saw's tablctop can be a problem. 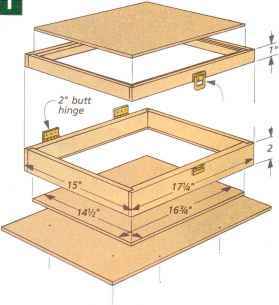 To hold the fence at the desired angle, I rely on my saw's miter slots and a pair of hardwood bars, as shown in the sketch. Tightening the two knobs expands the bars so they grip the miter slots and the fcncc. Use medium-density fiberboard (MDF) or plywood for the fcncc, and smooth and wax the working edge to rcducc friction on the workpiccc. 'A-in.-wide slot for machine screw. bar to fit miter slot.